I was telephoned before Christmas by a very enthusiastic young lady telling me that she worked for a television production company. 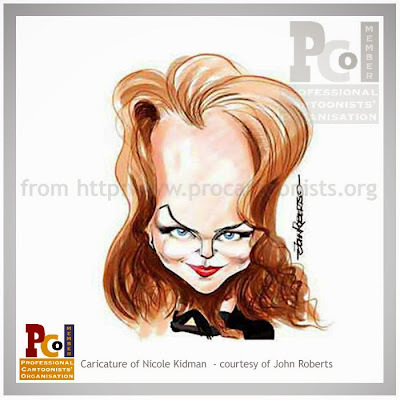 She told me she thought a caricaturist was something that they were looking for. It is possible I may have turned down a great opportunity but I feel I’ve retained what’s left of my dignity. Bloghorn says click R for Roberts. 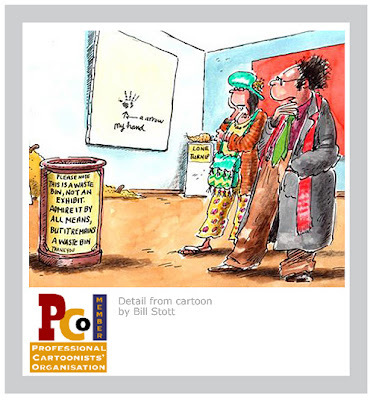 Humour exhibition: Where are the cartoons? The Hayward Gallery on London’s South Bank is hosting an exhibition of art called Laughing in a Foreign Language until April 13. It brings together more than 70 videos, photographs and interactive installation works by more than 30 artists from all around the world. They’re all artworks designed to make you laugh, so it’s baffling that the show does not include any cartoons. “Mainstream TV news is usually out of its depth when dealing with contemporary art, especially the difficult stuff where you can’t tell what it is, or when it’s not Constable. Coverage is usually jokey and heads are shaken in disbelief. Emin, Hirst and others have become national treasures through it – not because of the quality of their work but because Joe Public wants to see what they get away with. “The Hayward’s current show, involving funny work by serious artists, featured on TV this morning. No punters were seen laughing. Or smiling. Some were sitting quietly (and seriously) contemplating a video showing a clown struggling through the jungle. Others were failing to don a joke head which the curator giggled at. But then she giggled at all the deeply unfunny exhibits. “The brief glimpse – and it was brief, so I may be doing the Hayward powers-that-be a disservice here – was depressing. Here, apparently, was serious money being lavished on a well-presented show of distinct, serious failures. Gags were laboured and clunky, and all heads seemed firmly shoved up bottoms. It reeked of that preciousness often found in serious tomes about humour. Bloghorn says click S for Stott. 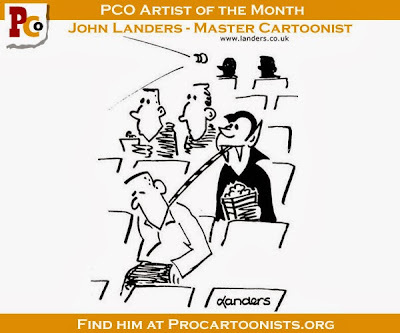 Here is the last offering from the PCO’s Artist of the month for January 2008, John Landers. Next Friday, we will have a new featured portfolio to enjoy, but in the meantime, click L for Landers. 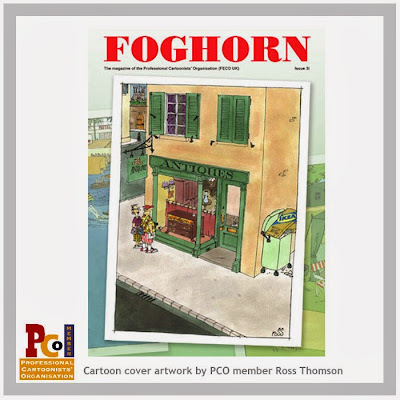 News reaches Bloghorn from the USA where a group of African-American cartoonists are making a “comic crossover” about how their work is treated and published. The group believe that “many editors and readers consider different ‘black comics’ to be interchangeable”. This, they say, is among the reasons why many papers run only one or two comics by African-Americans and other creators of colour – no matter how many strips and panels are in their comics sections. And of course, the size of the drawn sections of US newspapers are vastly larger than any published here in the UK. Full details of the event, which is scheduled for February 10th, can be read here, courtesy of Dave Astor at Editor and Publisher or at Darrin’s website. Something a bit different is competing alongside the usual anthropomorphic antics in the Best Animated Film category at this year’s Oscars. Persepolis, a black and white adaptation of two graphic novels by Marjane Satrapi, will be competing alongside the CGI-animated blockbusters Ratatouille and Surf’s Up, it was announced yesterday. Which means that a French film about a girl who comes of age during the Islamic revolution in Iran is up against a story about a rat who becomes a chef, and a bunch of surfing penguins. Persepolis is released in the UK in April, and judging from the above trailer it certainly looks like a pretty unique piece of work. If you would like to see more of John’s work click on the phrase John Landers in the long list you can find on the right hand side of this diary, or click below and follow L for Landers. 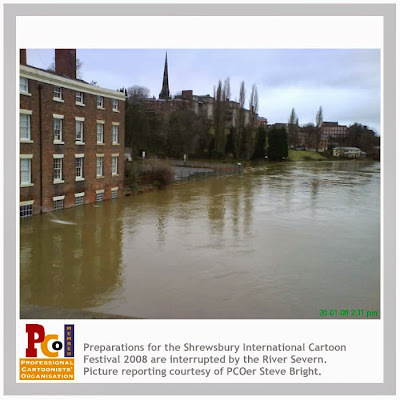 While you’re waiting for the Shrewsbury International Cartoon Festival, here’s another event to consider. Slapstick 2008 must surely be one of the first festivals of the year, of any variety, as it takes place from January 17-20. If you’ve not heard much about it, that’s possibly because it’s a festival of silent comedy. Now in its fourth year, the Bristol festival will feature “Pencil and Plasticine” a look at early silent cartoons hosted by the Aardman Animation co-founder Peter Lord. 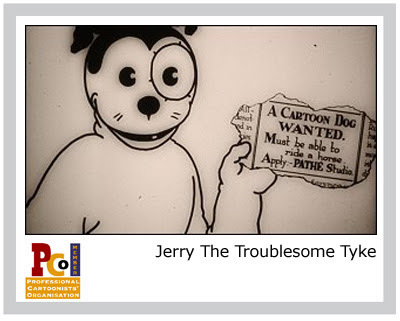 Extracts screened will include early Disney, work by Willis O’Brien and the unforgettable Jerry the Troublesome Tyke (above).